Have you ever had an identity crisis? I have, and I was not out of mind, but I was confused, and when I was confused I made a lot of bad choices. And I won’t get into a lot of who I was, but let me just say this with clarity, when I truly accepted Christ, as my Lord and savior, and I made the decision to obey God, and to take His word to heart, literally my mind changed, my perspective changed, and I no longer had an identity crisis. I finally came to realize who I was with all the mistakes I made, and yes my sins, that were now covered by the blood of Jesus, I received the mind of Christ. So no, I don’t have an identity crisis. I know who I am in Christ. And so as I observe my beautiful America, I see we as a nation are in the midst of an identity crisis. America before I go on, understand the “WHOLE MATTER”, that we need to fear God and keep His commandments. This could be said for any nation, but since I am an American born and raised, fourth generation citizen, I am very concerned. I will not judge my country, and condemn it. As I write this. But because I love this country, I pray we open our eyes, and see we need God to guide us to get us out of this identity crisis. Yet, by some of the actions of some, isn’t that what they are doing, in their own identity crisis by not keeping Gods commandments and fearing Him? They are confused, and making decisions that affects us all. We will ALL be judged. But before we are judged, I want to talk about the choices we have. I want to make this simple not complicated. To help us see, and get us out of this identity crisis. Because God is a gentleman, and He gives us choices. To either be good or evil, moral, or immoral. We have that choice and if we have chosen wrong, we can make the change, to choose good. The moral choices that separate us from those that do not. There is hope for us, as a country. There is hope for us individually. We can find our way again. But it does begin with knowing Christ, in fear of God and the consequences. And there will be consequences. Just open up a King James Bible, and see what they are. It scares me, to see the direction we are going in, as a nation. But I know God, and I know my rights as an American and I know, and see we are headed in the wrong direction. When you know God, you know who you are and as an American, I know my rights by the Constitution and as a Christian, one can see whats happening. I write this, because I care. And what I have observed lately, is that my beautiful America, seems to have a case of an identity crisis. Its like we don’t know who we are any more. We are one nation under God. Whether people agree with that or not, we are. Our foundation, created by God’s plan and our forefathers created the Constitution, so our rights would be protected. And there are some of us, yes quietly observing, and seeing our beautiful country, with beautiful traditions, and a beautiful Constitution being undermined, and being rejected. Literally, before our eyes. We are the land of the free. And if we are free we realize, in “GOD WE TRUST.” But with freedom, comes great responsibility. Yes, to our Lord Jesus, who died on the cross for our sins. And to the men and women, who have valiantly served us in this country, so our rights, our freedoms would be protected, and that our Constitution would be upheld, and honored. Some have died, and suffered greatly for us as a nation. Can we not see this? Even the families of our veterans have sacrificed. Letting their loved ones go off to serve our country. Freedom is not free, a price was paid for freedom. But if we do not see the value of this, we will choose evil and we will choose immoral. In this false sense of identity. But seriously, how can we choose good, and moral if we do not uphold, and honor the word of God, the commandments of God? How can we truly be a nation under God, if we just pick and choose what we want, and reject the “whole matter” concerning our nation, and concerning who we can be in God? It will be either good or evil, by the choices we make, and the end result will show what we have chosen. I am concerned. I am saddened, by the events of our world right now, but in our country, there are things that are being accepted, that totally go against who we are. We do seem to have an identity crisis. Years ago, history, shows us that we knew who we were. And we fought, a good fight of faith, to be victorious for others, and to show who we were as Americans. We are such a great nation, because of our freedom, but because we upheld this nation. We knew who we were and the”rule of the land” was accepted, and honored. But there are some who do not honor that “rule of the land” and we allow them to come into our nation, or even those who are home grown, do we allow them to dictate, what freedoms we should have? For any person, to deny someone any freedom even to express who they are as an American, that is wrong. When I read reports of people not being able to raise their American flag, because it may offend someone that is wrong. When I hear reports of people not being able to pray at a game, or in their school, or even mention the Lords name that is wrong. When I read reports of children at schools, being denied Christmas traditions because it may offend someone else that is just wrong! When I read that the cross, is brought down, because it offends someone, that makes me righteously angry! Christ died for our freedoms. When I read our military are denied freedom to pray, is this true? Every day, every single day I hear or read something in the news, and I wonder why is it allowed? I mean there are so many things I read and see that just make me shake my head, and I cannot believe how Americans have no sense of what is moral and immoral, of good and evil, and the choices that are made. And what about what is not reported? In the news? Why is valuable information that protects Americans not reported? Why are some entities of media not telling us all the truth? So with further understanding, I don’t understand why we are so confused, as Americans and yes are silent. Is it because one does not know who they are? Why are we allowing this? Do we not know who we are? As Americans, and as people of God, who yes do believe? Look if you don’t want to believe in God that is your right, your choice. But I do believe, and that is my choice and my right. I believe in my King James Bible, and I believe in the fear of God, that we will reap what we sow. I believe in the Constitution. And if we do not stand for that which is right, we will see all of our rights taken away. We will be confused. We are in some strange times to say the least. I am not going to blame any one individually except that ugly old devil, who does deceive, and yes wants to confuse all of us…That is Gods enemy, and we do not fight flesh and blood….Friends from the beginning of time, it was a battle of good and evil. If you know your Bible, you know God wins the battle. But if we do not learn real quick who we are, and uphold the old ways…..the ways of God, and the Constitution we are in trouble. Are we going to wake up, before its too late? It is a choice for good or evil of moral and immoral! America please wake up! I do pray, our leaders would choose the old ways, and that those we have elected, would have courage, to stand up for whats right not only for America but to know what Gods word says, and they have fear of God, in doing whats right. For this country. Decisions that are being made now, will affect our future generations, if Christ does not return soon. I pray our leaders would not be confused, or condone evil. If not we will be judged, and it will not be for good, but for evil, and not for moral but immoral….. I pray, as Christians individually we would be strong ourselves, and Christian leaders would speak truth, and not sugar coat or deny the word of God. By compromising it. I want my nation to be saved. I want my old America back, where there was just a beautiful sense of who we were as Americans, and yes the law of the land was upheld. WE did not have an identity crisis. And I want people all people of all nations to be saved, as the gospel states but it does not come by ignoring truth. This is not a message of hate, but of love. I love America. And I want to love all people, as my Lord commands us, but He tells us to Love Him first, and if we love Him, we will keep His commandments. And even though, I want to love all people as the commandment states with wisdom I do understand, all people do not love me, or us, as a nation. Because they do not love God. So the battle is His! Again in God we trust. So if I reach a nation, to get us out of this identity crisis wonderful! Glory to God. But if I just reach only one person who has an identity crisis, and knows this message is for them! That is also wonderful and glory to God! This is a team effort. As a nation, as Christians individually, who heed the call. Who understand truth, who understand, we need to get the mind of Christ, and get back to what is right. Please pray for our nation. Please pray, that we get back on the right path. Please pray, that we know who we are in Christ, (if you are a Christian) Please pray, that we all have courage. Please just pray…..
We need God more then ever. We need to repent, and clean the slate. We need to be united, as Americans, and not fighting one another. We need to help our nation. Yes it is wonderful to help other nations, but there are many suffering Americans who do not have food on their table. And what about our Veterans, some don’t even have jobs? Our American kids have a hard time getting jobs, let alone our senior citizens who also want to work. We have to take care of ourselves first, so we can take care of others, but it means getting right with God. It means we need to get our priorities straight, before we can even lose this identity crisis. We can once again be the great nation we were intended to be. United we stand, divided we fall. 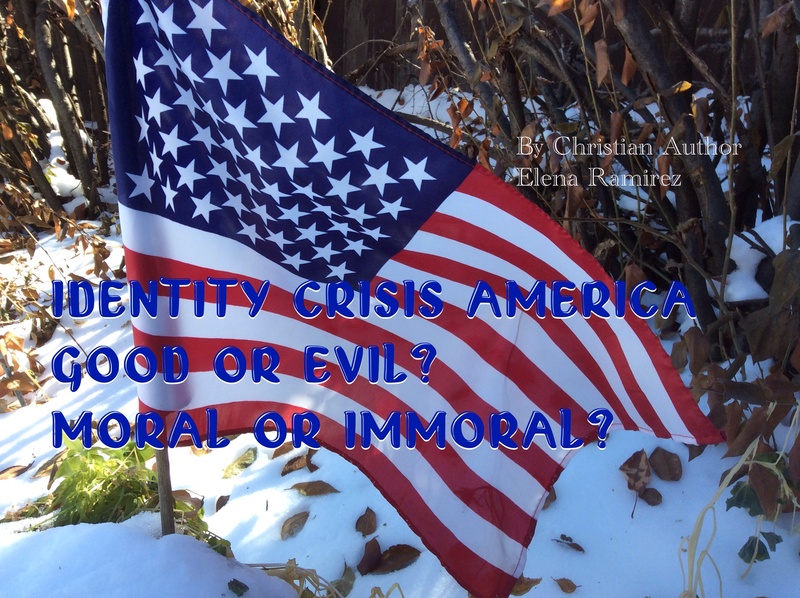 America please do not have an identity crisis…..Not now or ever. We need to get back to truth, and what God says, and what this nation stands for. To be free, the land of the free. May God bless America, but may we America bless God. And as I conclude this, we need to see we need a moral compass. To get back on track. If the word of God is not upheld, how do we expect the law of the land to be honored? We need God! This entry was posted in America, American, American Idol, answers from God, Army of God, BLESSINGS, Body of Christ, CHRISTIAN BLOGGERS WANTED, SCRIPTURE and tagged faith, glory to God, guidance, LOVE, obey God, peace, photography, religion, salvation, TRUTH. Bookmark the permalink. What is your statement of faith concerning the nature of your Salvation? I believe that God had to do all the work to save me. That is to say: I do not believe that I made a so called free will choice to say yes for Jesus to come into my heart, due to the fact that I was spiritually dead. Eph 2:1.
https://elenasjustmythoughts.wordpress.com/elenas-testimony/ This is a link to my testimony….Maybe this will help you with an answer. Let me ask you this, do you have fear of God? Because that is an indicator one is truly saved.